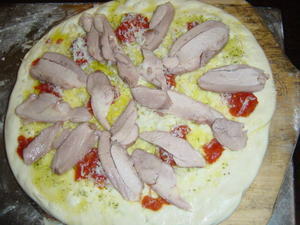 Make the sauce by combining the ingredients and let sit for at least a half hour. Shape the dough. Since we use the oil storage method, this is a little tricky. 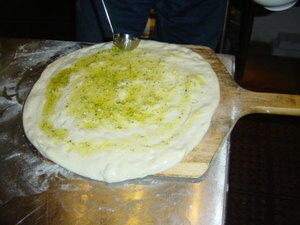 You have to remove the dough from the storage container keeping the top of the dough dry, and free of oil. Place it on the work table. 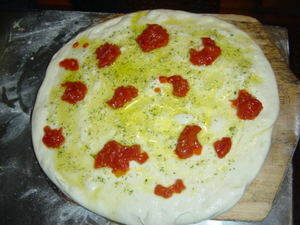 Sprinkle some flour on the top of the dough, and on the peel. 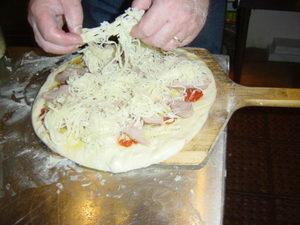 Use your hands to stretch the dough. Our recipe is moist, and soft, so this should be rather easy right on the table. 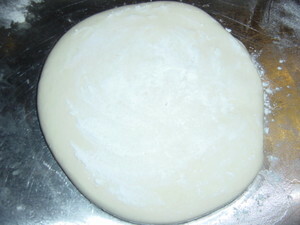 Pick up the dough by flipping the dry, floured side over the backs of your fingers and hands. Use your knuckles to further stretch the dough and when it's the right size, place the floured side down on the peel being careful to not get any oil onto the peel. This is very important. It's a sort of flip action, where you swing the draping pizza dough up and away from your body, and then straight down onto the peel. You can adjust the shape of the pizza now. 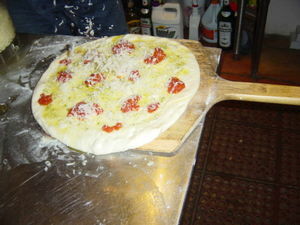 Use a ladel to spread some of the garlic oil/sauce onto the pizza... Be sure to avoid getting any on the peel. Sprinkle with some parmesean cheese. I added some really great tomatos from Italy. You can get them here: www.www.gustiamo.com. They are rather pricey, but really a great product. Rich tomato flavor. I just chopped them a bit, and spooned them on. I pre-heated the egg to about 500. I put the plate setter upside down with the normal grate on the plate setter feet. 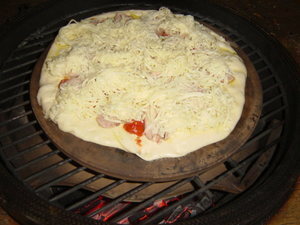 Then put my pizza stone on the grate. 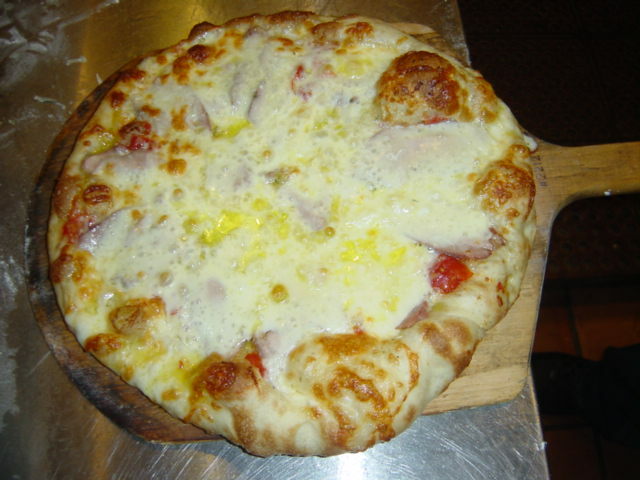 This avoids direct flames on the pizza stone. Preheat for about an hour so the stone is good and hot. 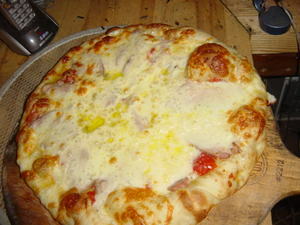 Also, you may want to quickly wipe the stone with a damp cloth (carefully) just before you put the pizza on. This will cool it just a bit, and help avoid a burnt bottom. Here it is coming right off the egg. 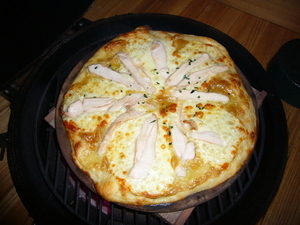 Here's a picture of a chicken caesar pizza. I made my own caesar dressing ( Ceasar Dressing ) which I spread on the raw dough, added cheese and the chicken which was pre-cooked sous-vide. Add the oil, and then the flour, followed by the yeast. I mix mine in a mixer with a dough hook, where I process the dough for about 10 minutes. I would think this would exceed the size of most food processors, but would probably be fine if cut in half. 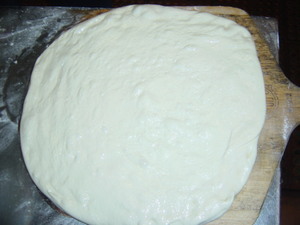 Process as you would any other dough. Alternatively, you could probably knead by hand for about 10 minutes.